Right around the time I started this blog, I stumbled upon Pham Fatale’s site, and fell in love with it. The site’s name is a perfect choice for someone called Pham and who looks as gorgeous as she does… 😉 But what captured me for good was her multi-cultural style of cooking. Keep in mind that she was born in Paris, with parents who emigrated from Vietnam in the mid-70s. To make things even more interesting, she married a man who is also the son of immigrants, his parents came from India. If that does not make for an amazing array of recipes, I don’t know what would. Check her site and you will also be smitten by it, she is an amazing photographer and her recipes quite creative and unique. Jackie is a busy bee – she has a young baby, and cooks for a large family that includes teenagers with dietary restrictions – but even with such intense life she managed to publish her first cookbook. I asked her permission to publish a recipe from it, as well as write a little review. The book is called Haute Potato, and it includes 75 gourmet recipes using this “humble” vegetable. In Jackie’s hands, the potato is anything but humble! Prepare the potatoes: wash and peel the potatoes. Shred 2/3 of them and place in a large mixing bow. Add the lemon juice and cover with cold water. Let sit for 5 to 10 minutes. Drain the potatoes and discard the liquid. Place all the shredded potatoes in a cheesecloth and remove as much excess wter as possible, than pat dry with paper towels. Pace inside a large bowl. Coarsely chop the remaining 1/3 of the potatoes and place them into the bowl of a food processor. Add the parsley, shallots, and leek. Pulse into a smooth raw puree. Add the mixture to the shredded potatoes. Make the batter: in a mixing bowl, beat the eggs with the cayenne pepper and the flour for 2 to 3 minutes, until slightly thickened. Add the nutmeg and baking powder. Add this egg mixture to the potatoes. Season with 1 teaspoon of salt and 1/2 teaspoon of pepper. Stir well to combine. Fry the galettes: heat the oil over high heat in a large Dutch oven or heavy-bottomed pan. You should have 1 inch of oil in the pan, so use as much oil as needed for that. Form small flattened patties with the potatoes (if you have disposable gloves, they work well if you grease them lightly with oil). When the oil is very hot, drop the patties into it, making sure they don’t touch each other. Lower the heat if they seem to brown too fast, and cook them for 5 to 8 minutes, until browned on the first side, then flip them and cook for about 3 more minutes on the second side. Season them with a little extra salt as you remove them from the pan and place on paper towels to absorb excess oil. You can fry them and keep them warm in a low oven until serving time. (makes 6 servings, about 12 galettes). Comments: I made one small modification to th recipe, and that was to add about 4 times as much parsley as it called for, which explains that my galettes had a bit more of a green aura than Jackie intended to. Let’s not delve too deeply into the issue. 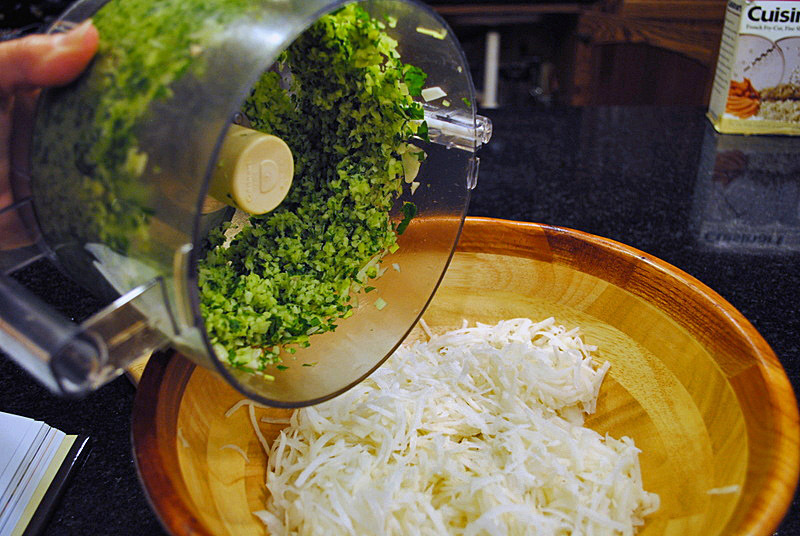 Suffice to say that I prepared the parsley to use in two different venues, and some unexpected firing of neuronal cells made me dump the full amount into the food processor. No harm was done to the galettes as far as taste is concerned. 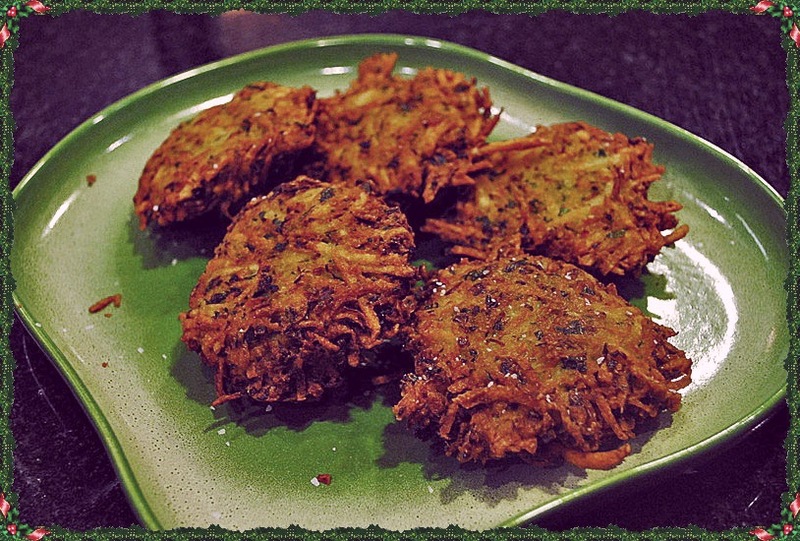 The key to the great texture of these fritters is the use of potato in two forms: grated and processed into a paste. It gives the galettes a very creamy and pleasant texture. 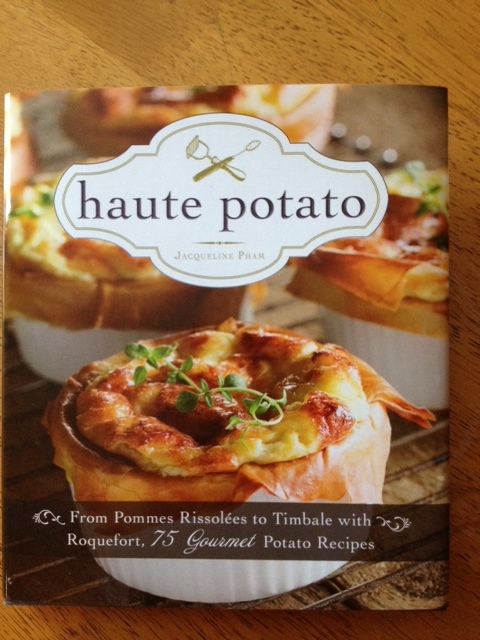 ABOUT HAUTE POTATO, THE COOKBOOK… I love the way the chapters are divided in an unorthodox way. Each chapter gives one type of “outcome” for the potato. Here is a list of them with one example of a tempting recipe found in it. Yes, baby, teenagers, and cookbook… makes me tired just to type about it! Might this book contain the secret to crispy sweet potato fries? Also many recipes with sweet potato, which I absolutely adore! These crunchy galettes have a place in many ethnic cultures and each has their own version. The basic potato is elevated to a new heights when served with a basic beef stew, or with a dollop of sour cream and a side of applesauce. We prefer these thin and crisp, and avoiding processed oils cook them in homemade lard. No hydrogenation, much healthier and the flavor is out of this world! Keep them crisp on a wire rack in a low temp oven. The cookbook is intriguing. One basic ingredient used in numerous kitchens worldwide. I like they way you reviewed each chapter with a tempting recipe. This sounds like a great way to prepare potatoes, Sally, and what a path they took to get here! Like her blog, Pham’s cookbook is a real find. I stole a peek of it on Amazon and liked what I saw. Thanks for sharing. Wishing you and yours a most memorable Holiday Season, Sally, and a wonderful 2013. I wonder if in some recipes for latkes the potato is also processed as part of the batter? I thought latkes would be a little more on the crisp side, and thinner. But hey, I am no expert! I assume that there is, somewhere, a latke recipe with some pureed and some shredded potato. Despite my Jewish heritage, I wouldn’t call myself an expert either (I’m not a fan of deep fried foods in general). Given these galettes, I think that you can now feel as if you’ve made latkes. Thanks, Jackie. Those (http://www.phamfatale.com/cat_11383/tag_potato-cutlet/) look delicious. We’re big fans of Indian food here in the StevenHB family. I like her site too! This recipe looks wonderful! Another Pham Fatale’s fan! Welcome! Thanks for visiting the Bewitching…. You should definitely check her site – a couple of years ago she blogged DAILY. One blog post per day. Can you imagine? And each post very involved, artistic photos, nice text and her own recipe. Pretty amazing.